The only AI-powered chatbot built for management training and coaching. 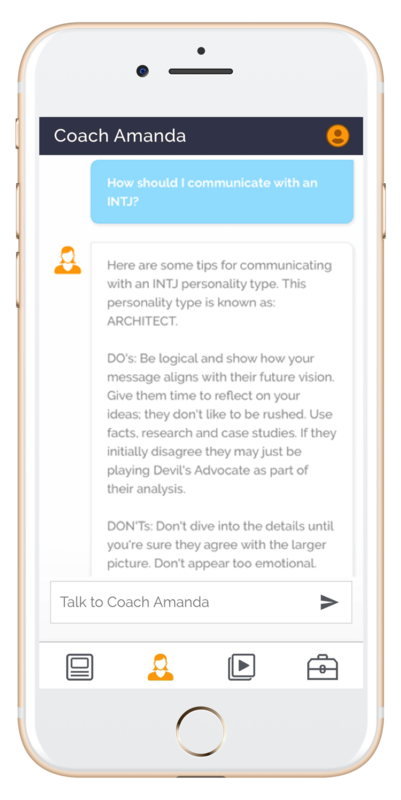 The "Coach Amanda" HR chatbot is like texting your best friend—if your friend happens to be a great leadership coach. Ask Amanda about employee problems or for leadership tips. And she teaches dozens of leadership development topics including giving feedback, delegation, and one-on-one meetings. Because the Coach Amanda HR chatbot knows your personality, she’ll personalize your manager training down to the sentence level. Every manager deserves a coach. Now featuring HR Chatbot Coach Amanda for effective leadership development and management training.